There is a well-known quote attributed to Jean-Luc Godard: Je suis marxiste, tendance Groucho (I am a Marxist of the Groucho wing). I have long thought that it was said by a character in one of his post-1968 films, but I have just found out that the film in which a character says it is not by Godard but by Claude Lelouch, L’aventure, c’est l’aventure (1972). It must have just seemed to people to be the kind of thing that Godard would say. I had assumed that somebody, somewhere, might have coined a similar phrase: Je suis chauviniste, tendance Ingrid (I am a chauvinist of the Ingrid wing), that is, a fan of the beautiful French actress Ingrid Chauvin. But a Google search for the phrase came up empty. So I am hereby offering it to the world. And I don’t care to whom it will be attributed. Practically all English-speakers with a smattering of history know that the heroine who help save the French kingdom from the English in the 15th century was Joan of Arc. English-speakers with some knowledge of medieval culture or with interest in old music may also know that the first known woman composer was Hildegard von Bingen. Catholics know of both women as saints of the church: Saint Joan of Arc and Saint Hildegard von Bingen, both famous for their celestial visions. If Bingen is the place that Hildegard is “of” then of course Arc would be the place that Joan is “of”. So where is Arc? In French (at least modern French), Joan is known as Jeanne d’Arc, and “of Arc” is simply a translation of “d’Arc”. It’s curious that such a translation was made, because there are plenty of British families with surnames beginning with de or d’ (De Courcey, D’Arcy etc.) who have felt no need to replace the French preposition with an English one. Normally such a replacement is made only when “de” refers to a territory of which the family is or was the ruling house, so that there is an implied “king” or “countess” or “prince” preceding “of”. Even the famous French general Maurice de Saxe is usually known in English by that name, even though he was in fact a count of Saxony, being an illegitimate but acknowledged son of the Elector Augustus the Strong. But in fact there is no place named Arc that Jeanne’s family might have any relation to (cryptic crosswords, in which ARC is sometimes clued as “Joan’s Place”, notwithstanding). The family name was Darc. The apostrophe came into general use in French a century after her death, but even then the name continued to be written without it, for the most part, until the 19th century, as can be seen in the illustration on the left below (from 1753); it is present in the one from 1817 (center), but as late as 1865 the historian Nicolas Villiaumé chose to avoid it (right). The spelling “d’Arc” was intended to give Joan a cast of nobility; during the reactionary Bourbon restoration (1815–1830) the idea of a commoner like Jeanne Darc (a farmer’s daughter) would not have sat well as a heroic figure. In Schiller’s Die Jungfrau von Orléans (1803) the surname is also written as d’Arc, specifically in reference to Johanna’s [sic] father who is named Thibaut d’Arc, far nobler-looking than his real name, Jacques Darc. Vuillamé’s treatise, however, bears the subtitle “Refutation of various errors published until today,” one of which concerns precisely the writing of the name. To this he devotes an extensive note in which he proves convincingly that the apostrophe is erroneous; he points out in particular that, apostrophe or not, if the initial D of Darc had represented an elision of “de” then in Latin texts the name would appear as de Arco, but it does not. Before the 18th century the heroine was generally referred to as La pucelle d’Orléans (the Maid of Orleans). In Shakespeare’s Henry VI (at least in the editions listing dramatis personae, which the Folios don’t) she is Joan la Pucelle (with the description a Maid pretending to be inspir’d from Heaven, and setting up to be Championess of France); and in the 17th-century poem La Pucelle by Jean Chapelain she is not named at all but called just La Pucelle or La Fille (‘the girl’). 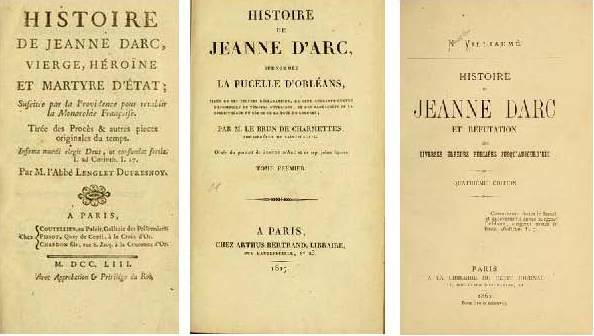 In the 1750s, however, Voltaire published a satirical poem (making fun of Chapelain’s opus) titled La pucelle d’Orléans, and there the Maid is called simply Jeanne, except for one instance in which she is Jeanne d’Arc. Since the book was published in London, among other places, it was perhaps from there that the British got the “Joan of Arc” meme. Anglicizing her name as Joan is, of course, a carryover of old practice, when this was routinely done with the names of prominent personages; but it is no more. Thus the new king of Spain is called, in English, Felipe VI, while his five previous namesake kings go from Philip I (1504-1506) to Philip V (1700–1746). And Felipe’s father is generally known as Juan Carlos, not John Charles. Now, it so happens that the first four of these Philips were descendants of the Austrian House of Habsburg, the first one being a son of the Emperor Maximilian. But his descendants, forming the Spanish branch of this house, chose “de Austria” as their family name, and those among them who were not royal princes (infantes) became known as “X de Austria”; the best-known among them were two generals named Juan de Austria (one was an illegitimate son of Charles V and the other of Philip IV). They are both known in English, however, as John of Austria, creating the false impression that they were Austrian. Perhaps its time to apply retroactively the modern style of keeping names original. Then Joan would not even be Jeanne, but Jehanne, as she herself wrote her name. You are currently browsing the Coby Lubliner's Blog blog archives for August, 2014.